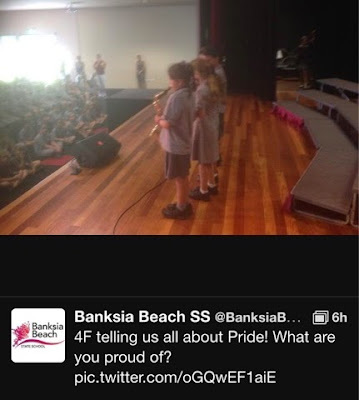 Today five of the students got up on parade and talked about what makes them proud. Charlotte, Ellen and Hayley started by playing Hot Cross Buns on their saxophones / clarinet. Bailey was our 'reporter' asking the others what types of things made them proud. The students mentioned lots of the wonderful things available to them at school - choir, badges (citizenship, academic, sporting), dance troupe and instrumental music. Christian did a great job of answering Bailey without looking at his notes. I think it was a bit nerve wracking for the students because we were the first class to do a social skill, but I'm so proud of how well they did. Special mention goes to the rest of 4F who gave really constructive feedback during our practice run through. Mrs King even tweeted about us! If you were at Parade today, we'd love to hear what you thought!